The Nation Magazine calls Raising Expectations the Most Valuable Book of 2012! A veteran labor organizer whose tactics have earned her admiration and condemnation McAlevey pulls no punches. She says of the current moment: The only crisis, the only fiscal cliff in this country that anybody, especially the labor movement, should be talking about is the fiscal cliff that Wall Street forced every American worker to walk off in 2008. And by the way, if you’re poor, you’ve been hanging on that cliff forever. On a branch. That’s the spirit that infuses this memoir/manifesto, which calls for putting the movement back into the labor movement. McAlevey argues that unions must make connections to communities and social justice campaigns if they’re going to renew themselves and transform the economy. After the 2012 election, she said, With our breathing room that we have now, we have to totally reframe the crisis. McAlevey’s prescription is right: raise expectations, and then raise some hell. Barbara Ehrenreich, author of Nickel and Dimed Raising Expectations is a breath-taking trip through the union-organizing scene of America in the 21st century. In the battles McAlevey recounts, hardly anyone comes out standing tall. But her story, along with those of so many brave health care workers, fills me with hope. Bill Fletcher Jr., author of They’re Bankrupting Us and Twenty Other Myths about Unions This book is gripping, funny, sad, and very thought-provoking. 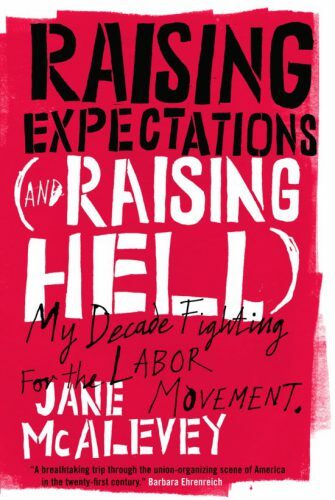 Jane McAlevey uses her own experiences in a movement that has been undergoing dramatic changes within a workforce that has undergone even greater changes to suggest to the reader the necessity and potential for a transformation of the union movement into a real labor movement. Once I started reading it, there was no stopping. Francis Fox Piven, author of Who’s Afraid of Frances Fox Piven This book casts a bright light on the problems of American unions. Jane McAlevey gives us an on-the-ground account of the obstacles the union hierarchy throws in the path of a bold and energetic organizing effort that scored a string of brilliant successes before the hierarchy cracked down. We need to read this book and learn its lessons partly for what it tells us is wrong about unions, but also because it demonstrates that good organizers can in fact succeed. That message is heartening because the simple truth is that we can’t rebuild a democratic left in the United States without a revived labor movement. Van Jones, author of The Green Collar Economy, This book renews my faith that organizing works. It calls for a new kind of unionism and makes a compelling case for a new vision for the American labor movement. In the whole worker theory that McAlevey tested and retested in real life campaigns, all the issues negatively impacting the poor, working and middle class become the cause of unions, not simply wages and narrowly defined workplace conditions. At a time when climate change is wreaking havoc at home and abroad and communities of color are becoming the vital center of progressive social change, this book offers one path to building a movement that can and must tackle many issues. Raising Expectations is so refreshing because it aspires to tell us how we can rebuild a movement that can win.